Question. 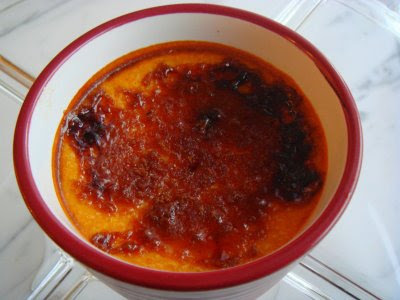 What is the first thing you thing about when you hear creme brulee? Is it, fancy dessert? Is it, caloric assault? Cholesterol overload? Impossible to make at home? The thought that goes through my mind when contemplating making this dessert is whether I should buy a mini flame torch. The reason I never do is I am convinced that once I get it, it will remained packed up at the back of a cupboard somewhere, next to my mini chopper, my crepe pan and my condiment spoons, only to be found if, and when, we move. Now, having actually made the dessert for the first time, I have found that possibly the mini torch would have caramelized the sugar more evenly than under the broiler. That being said, the broiler is a good alternative. The two main ingredients in creme brulee are heavy cream and egg yolks, typically six to eight yolks for a recipe yielding four servings. Here, I used two yolks and, in place of heavy cream, I substituted low fat evaporated milk. For the rich velvety texture characteristic of this dessert, using butternut squash puree was ideal. It has both body and a creamy texture; exactly what was needed here. You will notice the oven temperature starts out at 400 degrees fahrenheit and is then lowered to 350. This is crucial because the high temperature sets the dessert while the lower one allows it to continue cooking with being grainy. 2. Dissolve the milk, sugar, and dry milk in a sauce pan over medium heat. Add the freshly grated nutmeg and cook for 10 minutes. Do not bring to a boil. Remove 1/4 cup of mixture and set aside. To the remaining mixture, whisk in the butternut squash. Remove from the heat and allow to cool slightly so that when the eggs are added they will not scramble immediately. 3. Meanwhile, whisk egg yolks with reserved milk and return to pumpkin milk mixture. Whisk thoroughly. 4. Pass mixture through a sieve to remove any lumps and divide among four 4"ramekins. Bake in a water bath at 400 degrees F for 10 minutes. Reduce heat to 350 and bake for another 20 to 25 minutes. 5. Once cooked, the custard can be refrigerated over night before caramelizing the sugar crust. To do so, sprinkle approximately half teaspoon (or more) of sugar on the top of each custard. Using the back of a spoon spread to completely cover the top. Caramelize using a blow torch or under the broiler for less than two minutes, monitoring closely to prevent charring. Chill before serving. *To make butternut squash puree, peel, seed, and cut a squash into cubes. Add to a large pot with about an inch or two of water. Cover with lid and steam over medium high heat for 15 to 20 minutes until easily pierced with a knife. Puree in blender or food processor. absolutely fabulous, i TOTALLY have to make this!!!!! Your healthy twist on this classic recipe sounds delicious! I'd like to include you recipe on our blog :). Please let me know if you're interested!